AREAWIDE — The Southeast Connecticut World Affairs Council (SECWAC) hosts Charles M. Sennott on Wednesday, Nov. 14 when he will speak on “GroundTruth in a Post-truth Era,” at 6 p.m. The talk will be held in the Ernst Common Room at Blaustein Hall in Connecticut College. 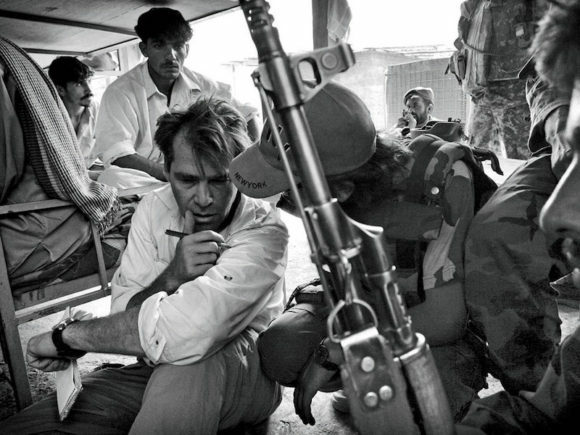 An award-winning foreign correspondent and founder of The GroundTruth Project, Sennott will discuss the work of this non-profit news organization around the world. Specifically, Sennott will look at the assault on a free press in the US and globally and how it is impacting international coverage. A crisis in journalism is becoming a crisis for democracy. Sennott is an award-winning correspondent, best-selling author, and editor with 30 years of experience in international, national and local journalism. A leading social entrepreneur in new media, Sennott started GroundTruth in 2014, and in 2017 launched the non-profit organization’s new, local reporting initiative, Report for America. Reporting on the front lines of wars and insurgencies in at least 20 countries, including the post-9/11 conflicts in Afghanistan and Iraq and the 2011 Arab Spring, Sennott began his career in local news covering cops, courts, and municipal government. Sennott’s deep experience reporting led him to dedicate himself to supporting and training the next generation of journalists to tell the most important stories of our time. Sennott is also the co-founder of GlobalPost, an acclaimed international news website. Previously, Sennott worked for many years as a reporter at the New York Daily News and then the Boston Globe, where he became Bureau Chief for the Middle East and Europe, and a leader of the paper’s international coverage from 1997 to 2005. Sennott has also served as a correspondent for PBS Frontline and the PBS NewsHour. He has contributed news analysis to the BBC, CNN, NPR, MSNBC and others. He is a graduate of Columbia University’s Graduate School of Journalism and was a Nieman Fellow at Harvard University. A reception will begin at 5:30 p.m., with the main event beginning at 6 p.m. The presentation is a part of the SECWAC 2018-2019 Speaker Series. For non-members, tickets ($20) may be purchased at the door; ticket cost can subsequently be applied towards a SECWAC membership. Attendance is free for SECWAC members (and their guests). Membership September 2018 through June 2019 is $75; $25 for young professionals under 35; free for area college and high school students. Immediately following the presentation, SECWAC meeting attendees have the option for $35 to attend a dinner with the speaker at Tony D’s Restaurant, New London. Reservations are required at 860-912-5718. SECWAC is a regional, nonprofit, membership organization affiliated with the World Affairs Councils of America (WACA). The organization dates back to 1999, and has continued to arrange eight to 10 Speaker Series meetings annually, between September and June. The meetings range in foreign affairs topics, and are hosted at venues along the I-95 corridor, welcoming members and guests from Stonington to Old Saybrook, and beyond. SECWAC’s mission is “to foster an understanding of issues of foreign policy and international affairs through study, debate, and educational programming.” It provides a forum for nonpartisan, non-advocacy dialogue between members and speakers, who can be U.S. policy makers, educators, authors, and other experts on foreign relations. Learn more at http://secwac.org.